Late though I might have been, I finally managed to take the kids along to see The Adventures of Tintin. They weren’t that interested at first, and I can understand why, since the marketing is targeted at a higher age group and is certainly intended to attract adults. And by the time we went, it was no longer showing at Limelight, and we had to settle for Hoyts. I don’t know why I particularly wanted to see this movie, as I never read the comics or had any experience of it before, but the trailer had me enthralled, and I was really keen. Obviously, the usual problem with films that you’re really eager to see is that they fail to live up to expectations. Not the case with Tintin. The characters are really engaging, especially the bumbling detectives who are simply the most hilarious of characters. Tintin himself is endearing in a very personable way, since he is admired by all the characters for his prowess, but is nonetheless genuinely concerned with other people’s welfare. He is, at the same time, subject to frustrations and these shine through with pristine dialogue and amazing animation. I’m not normally a fan of animation that looks too realistic, I’d usually prefer cartoons to look like cartoons, but in this context it just works. 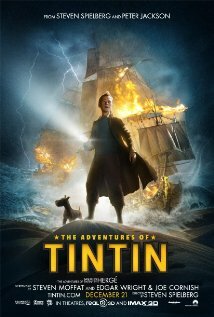 The Adventures of Tintin is barely a children’s movie; there is a fairly long-running theme of violence, but it is handled well, and though my daughters (age 10 and 7) tensed up a lot, I never felt uncomfortable with the level of violence they were seeing. This is a great film, especially for its characters, but also for its excellent animation.